Most of the tree writing I have done in my own work have been drawn of my imagination, therefore end up as fictional trees. 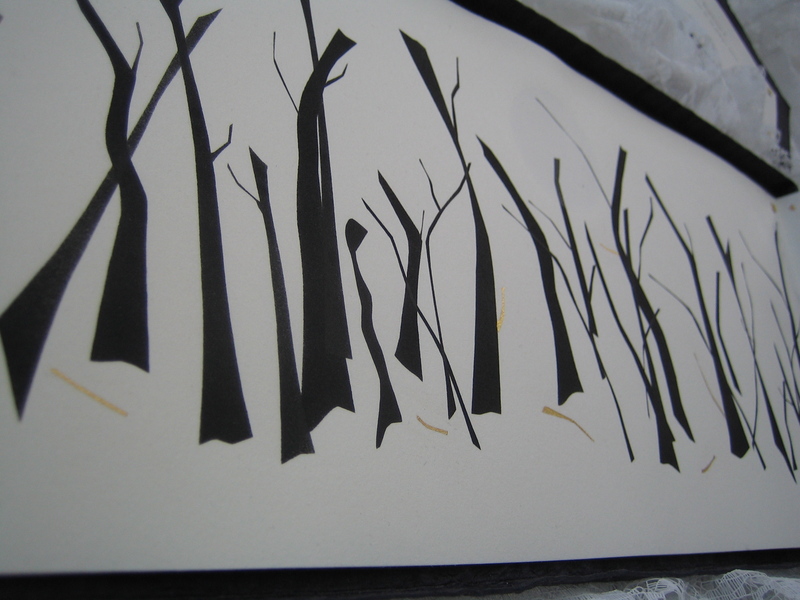 I do however draw inspiration from the real trees and forests that surround me (they have influenced many aspects of my work), so I use these as models and fodder for my imagination. 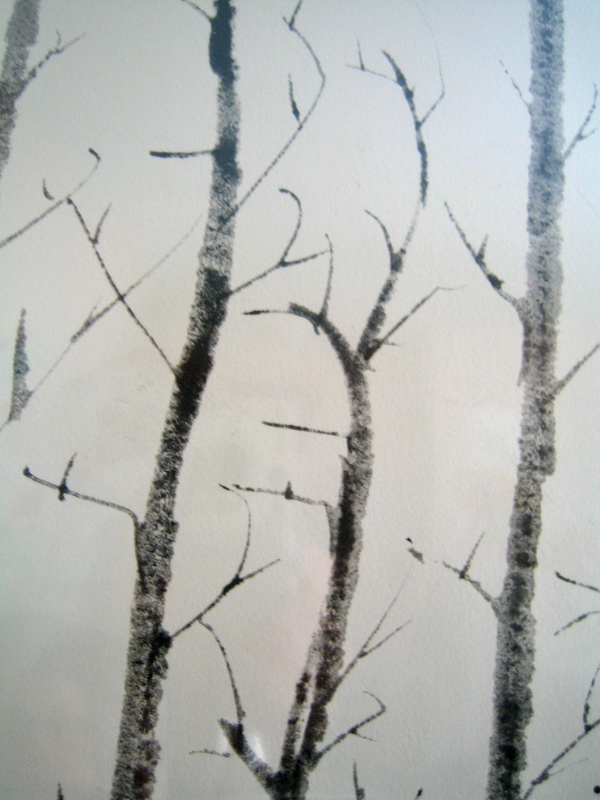 In the last few years I have written these trees out many times with various mediums such as sumi ink, printmaking inks, watercolours, gouache, and of course with various grades of graphite pencils; I have applied these mediums with some very interesting hard tools such as the mapping & pointed pens, the cola pen, ruling pen, and various types of broad edge calligraphy pens. 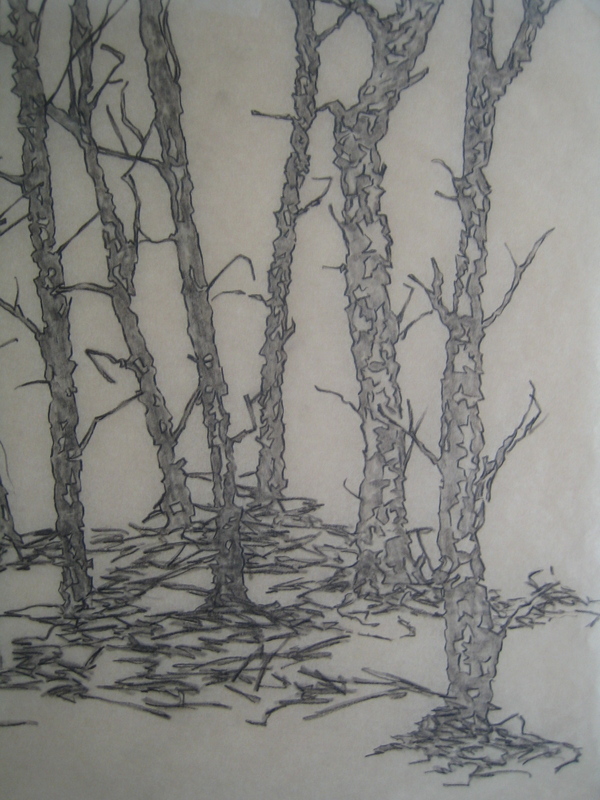 My trees have been rendered on many different types of fine papers, mylar, and vellum tracing. 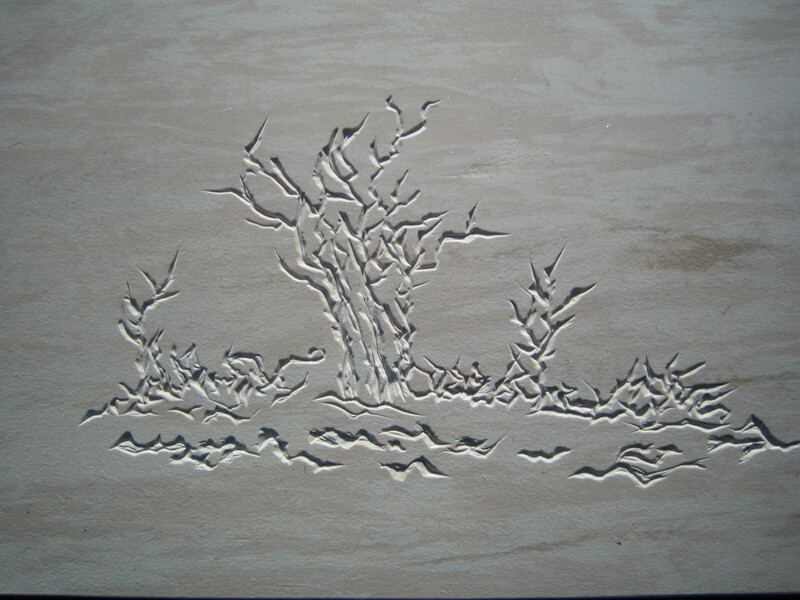 I’ve also carved my tree works onto linoleum with very sharp tools for what I call my inkless prints that I either work by hand or run through an etching press. As I reside in a rural area next to a large lake, I am surrounded by trees. 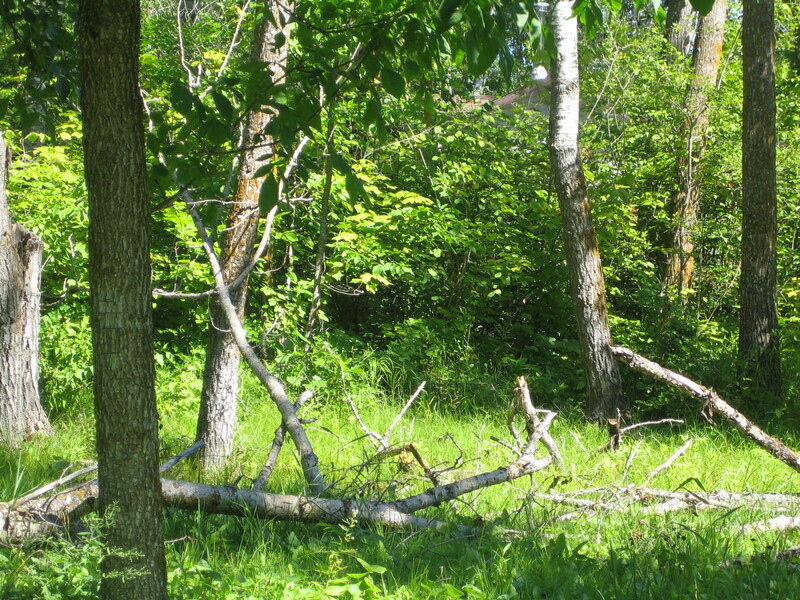 There are many bursts of both large and small forests in my area. The simple idea of writing trees leads me to imagine the many potential variations of the same tree or set of trees I can record from. 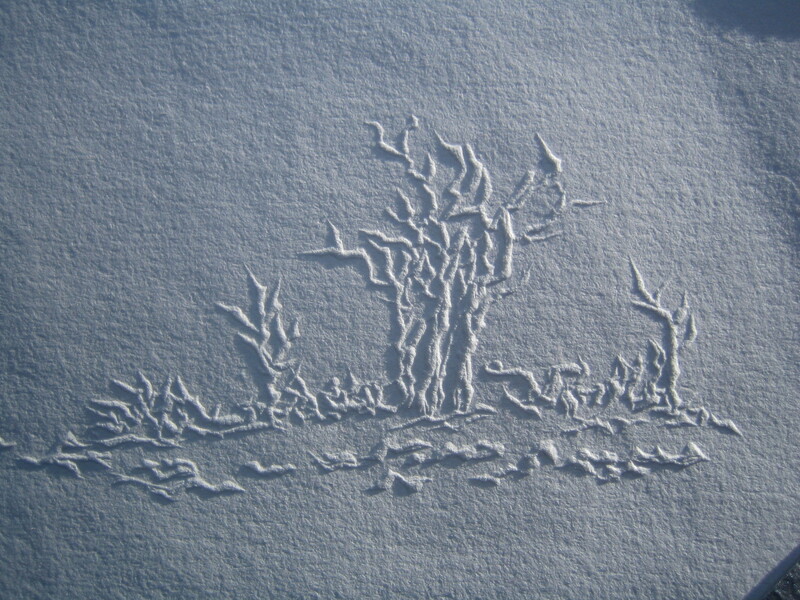 You could, depending from where you stand, look at these trees and find that variant factors will affect the final outcome of your real life composition: such as the season, the time of day, whether the wind is blowing, the sun is shining, the sky is cloudy, the branches are wet from the rain, or are covered in snow or hoar frost, whether the branches are bare or in full foliage, etc., etc…. so that each condition and time of moment is certain to affect the outcome of the final result of your composition. 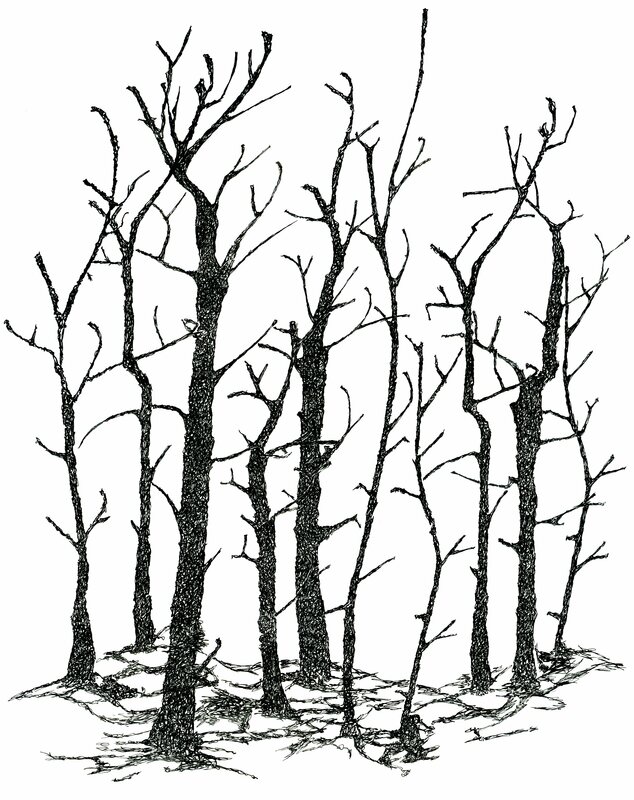 While writing out my trees, I am also in awe of the fact that I will probably never get to see that set of trees and branches in the exact same way again. An early summer gale-force storm felled some trees on my property. There was some discussion of cleaning these up, but I saw these trees as something sculptural, and decided to leave the felled trees there. In time they will dry up and blacken, and add calligraphic line to that section of the yard. 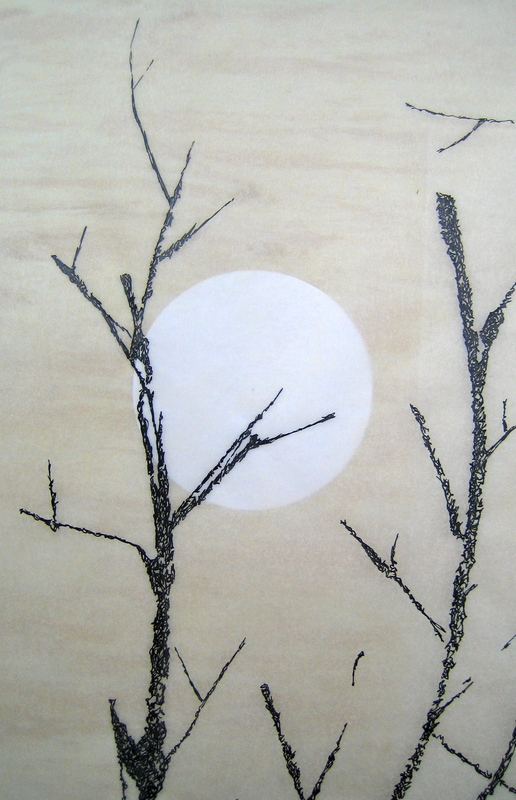 It is an experiment… These trees are, of course, more fodder for my imagination…I intend to write these trees too.